When Kyocera Document Solutions began planning a high-profile global launch of their new line of multifunctional business printers last fall, they naturally chose longtime partner Ridge Marketing to make it happen. As a full service marketing firm, we have the capabilities needed to conceptualize, write and execute a multifaceted campaign across the web, print, video and events. And as a longtime Kyocera marketing agency, we already had the clear understanding of their brand, voice and internal process needed to make a brand launch go smoothly. Building around the concept of Game Changing Color, we created an email marketing campaign and banner ads to drum up interest in the new line ahead of the Kyocera road show this winter. We then produced signage and collateral to round out the look at the events. While building the roadshow’s look and feel, we also focused our attention on the brand collateral itself, including a print brochure, multiple datasheets, an interactive product tour, web presence, and product video. Click to watch the Kyocera TASKalfa 406ci Series Video. We look forward to “upping our game” on future product launches and to working closely again with our friends at Kyocera. 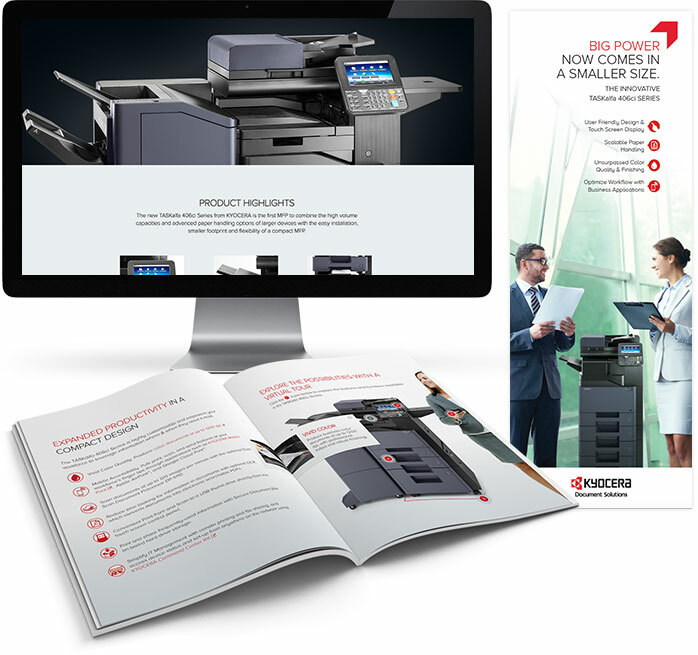 Click to launch the Kyocera TASKalfa 406ci Series e-brochure and interactive tour.